Start your new year with the song that I've just released! Announcing Axial Inclination, the first English song that I've ever produced! This song is released under CC BY-NC 4.0 license. The source files of the music is available at the end of this blogpost. In addition to that, I've modified espeak-ng, a text-to-speech engine, for generating the vocal, which is later mixed into the song using LMMS. It is reported that the lyrics sung by this vocal is difficult to be understood. Nevertheless, it's still awesome to have an FOSS vocal synth. CC BY-NC 4.0 license grants you permission to redistribute and modify this music for non-commercial purpose, provided that you give credit to "sadale.net". If you do not wish to attribute to sadale.net, or you'd like to use it for commercial purpose, please contact me with the email button on this website. Let me know what you'll be using it for. It's highly likely that I'll grant you the permission for using this music. Behold my first song ever released publicly: "The Lyrics of This Song are Weird". This song is about the suckiness of the song and its lyrics. Full lyrics are available here! 我原本係為左整game而學整音樂嘅. 直至到幾年前, 我大概每一年就整一首廣東話歌. 呢首係我整嘅第三首歌. 之前果兩首太差, 所以我冇放到出來. 呢首我覺得唔算好好, 但係都算係咁啦. 所以我就決定放出來喇. I learned music composition for game development. Since a few years ago, I compose Cantonese songs approximately once a year. This song is the third song that I've made. I didn't release the previous two songs because the quality were too bad. This one isn't good. It isn't that bad either. That's why I decided to release it. 呢個project總共用左8個軟件. 包括LMMS, Audacity, ProjectM, SimpleScreenRecorder, Inkscape, Spriter Pro, Aegisub同FFmpeg. 除左Spriter Pro之外, 其他都係免費嘅開源的軟件. In total, 8 software applications were used for this project. They are LMMS, Audacity, ProjectM, SimpleScreenRecorder, Inkscape, Spriter Pro, Aegisub and FFmpeg. Except Spriter Pro, all of them are FOSS software. 首歌係用LMMS整嘅. LMMS係一個俾你由零開始嘅整音樂嘅軟件. 幾年前, 我曾經幫過嘅佢地手, 開發LMMS呢個軟件. 而把聲呢, 係用Audacity錄嘅. 把聲經過處理. This music was composed with LMMS. 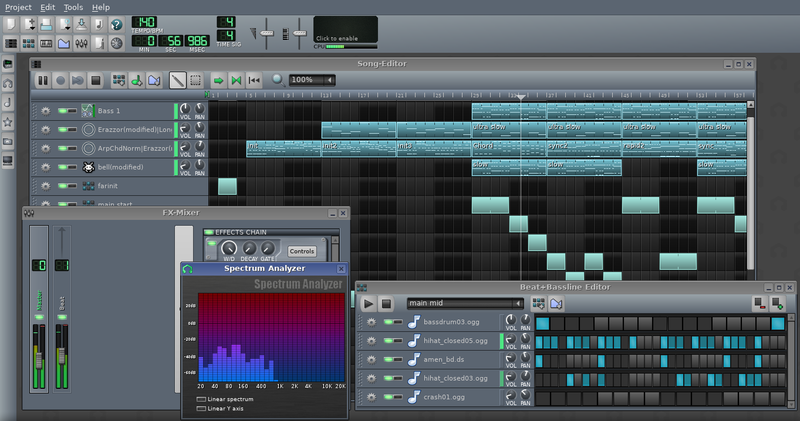 It's a music composition software designed for making music from scratch. I had briefly contributed to its development a few years ago. The voice was recorded and processed using Audacity. Some audio engineering was performed for the vocal track. 我無正式學過作曲. 如果我用錯D專有名詞嘅話, 麻煩同我講聲. 我會更正. 另外, 以上步驟唔係唯一嘅作曲嘅方法. 以前我都用過其他方法作曲. 呢D步驟只係想解釋返我點整呢首出來嘅姐. I haven't formally learned music composition. If I have used the wordings above incorrectly, do tell me. I will fix them. Please notice that it is not the universal solution of music production. I have tried out other approaches in my other songs. The steps above is just what I did for making this specific song. 作廣東話歌同其他語言嘅歌有一個好大嘅分別. 就係要啱音. 我地有成6個音, 要對返個melody其實都有D難度. 仲要整到個歌詞嘅意思都要啱, 難上加難. 所以我作作下就卡死左喇! Since Cantonese is a tonal language, I have to match the pitch of the melody notes with the tone of the Cantonese characters. Therefore, it's very tough to compose a Cantonese song as it's difficult to find the right word that has both the correct tone and the correct meaning. I was stuck in the midway while I was writing the lyrics. 跟住我用Python整左個廣東話填詞對音工具. 我搵到三個中文詞語嘅database. 配合埋粵語審音配詞字庫嘅聲調嘅資料(因為廣東話嘅聲調一直有變, 我自己再人手改左個審音字庫嘅部分聲調). 有左呢個工具, 我只要打低個音, 就可以搵晒D啱音嘅詞語. 由上面嘅cap圖可以見到, 呢個工具可以列出個database嘅啱音嘅字(但係有小量錯誤). 例如我打240, 就可以搵到同"240"同音嘅字. 包括"亂晒籠, 垃圾蟲, 定晒形, 未夠喉, 滑鐵廬, 落晒形, 鼻涕蟲". As shown on the screenshot above, the tool lists out all matching words that it found (with some minor errors). For example, if I type "240" (二四零), the first character of the word has to match the tone of 二, the second character must match 四, and the third character must match 零. The filtered result of the words is displayed, which includes "亂晒籠, 垃圾蟲, 定晒形, 未夠喉, 滑鐵廬, 落晒形, 鼻涕蟲" in the Chinese word database of Cantonese. 個工具仲可以俾你揀database. 目前個工具有廣東話, 大陸普通話, 同埋台灣國語嘅詞語嘅database. 雖然唔係所有歌詞都係用呢個工具作嘅, 但係呢個工具用來做brainstorming同埋搵D啱音嘅四字成語真係無得輸. 我以後應該都會繼續用呢個工具來填詞. Database selection is also supported. The current version of this tool supports Cantonese, Chinese and Taiwan-style Chinese. This tool helped a lot while I was writing the lyrics for this song. Although I did not exclusively use this tool for writing all of the lyrics, it was very useful for brainstorming and finding Four-characters Chinese Idioms that match the tone that I want. I will probably continue to use this tool for my future songs. 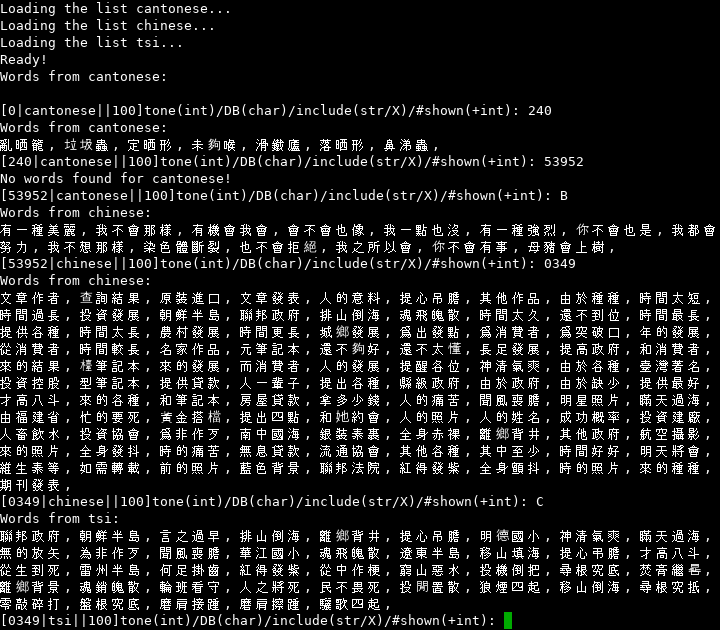 Unfortunately, due to the unknown license of some Chinese words databases, I could not release this tool publicly. I'm sorry about that. 填完詞就用Audacity錄音同改音. 下面幅圖係我改音嘅過程. 只要複製highlight左果part就可以延長隻字個音長. Delete左果part就可以縮短隻字個音長. 呢個步驟不停重複, 直至做到把聲同首歌同步為止. After the voice was recorded according to the lyrics written, Audacity were used for audio engineering. The image below shows how did I change the length of the Cantonese character that I had sung. By duplicating the highlighted part, the duration of that character is extended. Conversely, by deleting that part, the duration is reduced. This process was repeated for synchronizing my voice with the melody. 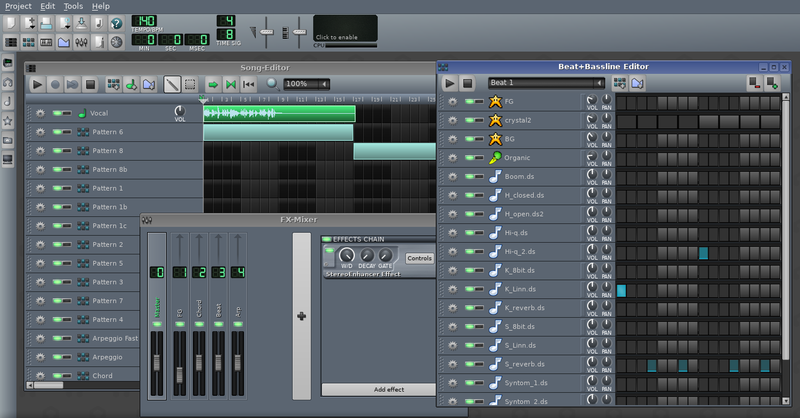 After that, the vocal track generated by Audacity was imported into the LMMS project. Finally, the song was generated by LMMS. After the completion of the song itself, a video for this song was produced. 我用左ProjectM來做Audio Visualization. ProjectM係一個實時嘅Audio Visualization軟件. 我用SimpleScreenRecorder來錄低作個audio visualization. 佢可以直接錄低任何program嘅OpenGL影像. 比起響軟件層面錄更有效率, 唔會疾下疾下. The audio visualizer software used in the video used was ProjectM. It is a real time audio visualizer. The visualization were recorded using SimpleScreenRecorder, which supports recording OpenGL output of any program. Compared with software-based recording method, recording the OpenGL output is much more efficient. Therefore, the output video is almost lag-free. 個招牌就用左Inkscape整. 跟住用Spriter Pro將個招牌變成動畫. 而字幕係用Aegisub整嘅. 跟住用Inkscape畫多一幅圖, 叫人subscribe我個channel. 最後用FFmpeg將LMMS整嘅歌, Audio Visualization, 字幕同個招牌冚把爛合埋一齊. 搞掂! The image of the banner was created using Inkscape. After that, it was animated using Spriter Pro. Image sequences of the animation were generated. The subtitles editor used for the video of this project was Aegisub. With this software, a subtitles file were generated. An extra image were drawn with Inkscape for the end scene that asks the viewer to subscribe my channel. Finally, the audio outputted by LMMS, the visualization of the audio, the banner image sequence and the subtitles were combined by using FFmpeg. That's it! 希望你會鐘意啦! | Hope you enjoyed it! 我係作曲新手. 呢首個我花左好多工夫, 整左成超過一個月. 如果你鐘意嘅話, 麻煩幫忙share一下. 如果你地鐘意, 我日後會整多D呢類嘅歌. 多謝支持! In addition, future collaboration is welcomed. Feel free to drop me a line by using the email address on this website. This year, I've developed the game E. M. Wave Jammer. It is the world's first telephone game in Global Game Jam, which is playable by dialing a telephone number. I FUBAR'd in last year's game jam. Fortunately, I did much better this year. This game is for entertainment only, no political message intended. For Hong Kong SAR phone numbers, dial 54839953. For non-Hong Kong SAR phone numbers, dial +85254839953 with skype. We do not accept international non-skype calls to save our operational cost. This game has Cantonese(Press 1), Mandarin(Press 2) and English(Press 3) version. Please notice that this phone number is temporary. It will be changed after I've finished setting up my phonesite. The game happens in Japan during Cold War era. In the game, North Korea is using advance electromagnetic waves technology for sending signals to Cuba. They are plotting to attack Japan. In the game, the player plays as the role of the commander of telecommunication department. The player is responsible for jamming the signals between them. For the ease of command, Japan is divided into 6 zones. The electromagnetic waves from North Korea will propagate via zone 1, zone 2, zone 3, zone 4, zone 5, zone 6, all the way to Cuba. The player is required to use limited amount of electricity to build jammers. Electricity are consumed for building the jammers. No electricity is required to operate the jammers. The more electricity you spend to build a jammer, the more powerful it is. For example, a 5W jammer can attenuate the signal by 5W. The remaining non-attenuated signal will become military information end up on enemy's hand. When the information level reaches 100%, you lose. The information level is increased by the Wattage of signal received divided by the Wattage of signal sent. There is no way to reduce the information level. The player starts with 20W of electricity. To generate electricity, generators have to be built. They generate electricity when signal pass thru its zone. For example, a 5W generator will cost 5W to build, and generates 5W of electricity. Each zone can only have one structure(e.g jammer, generator). New structure building on a zone with existing structure will demolish the existing one. Structures cannot be sold. After wave 6, there will be Accelerated E.M. Wave signal. It is able to bypass Zone 2, 4, 6. It is sent via Zone 1, 3, 5 to Cuba. After wave 11, there will be Narrow-band E.M. 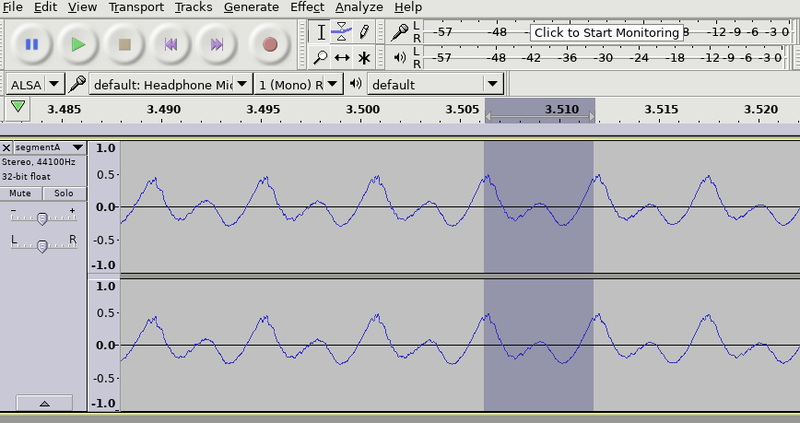 Wave signal, which includes low frequency E.M. Wave Signal and high frequency E.M. Wave Signal. Ordinary jammers are half as effective against these signal compared with other signals. Therefore, the player is able to build LF Jammers and HF Jammers to defend against these signals. A 10W LF Jammer can attenuate LF Signal by 20W, Ordinary Signal by 5W, and cannot attenuate HF signal. A 10W HF Jammer can attenuate HF Signal by 20W, Ordinary Signal by 5W, and cannot attenuate LF signal. After wave 16, there will be E.M. Wave from Cuba to North Korea, which propagates via Zone 6, 5, 4, 3, 2, 1 to North Korea. Accelerated E.M. Wave from Cuba propagates via Zone 6, 4, 2 to North Korea. After wave 21, there will be FM Signal. FM Signals is immune to Ordinary Jammers. It makes non-LF, non-HF FM waves very troublesome to be dealt with because they couldn't be attenuated by ordinary jammers. Yet, HF and LF jammers are only half as efficient to deal with non-LF, non-HF waves. Before the Jam, I've developed the hardware Dinbo Prototype B as well as its library libdinbo. I've also made a template for developing any telephone system based on this library. 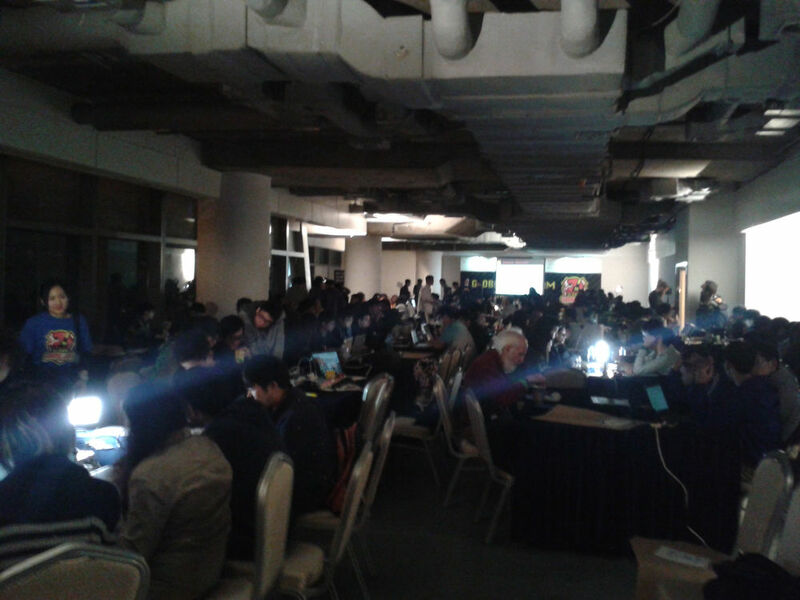 Just like the last year, the 48 hours game jam spanned across three days. In the first day, I've arrived at the venue, before the event started, I've found a bug on the library of Dinbo Prototype B that made it failed to detect DTMF touch keys properly. Fortunately, I fixed it right before it started. Some of the features are strike'd out at the design stage because I foresaw that it couldn't be completed within 48 hours. There were many jammers in our Jam site, and the Hong Kong SAR was the 8th largest out of 700+ jam sites all over the world in 2017! With the experience of last year, I won't sleep on-site because I couldn't. At the end of the day, I went to home and took a rest. Although I slept much better than last year, I still didn't sleep enough. Therefore, I woke up late. I started programming. Feeling dizzy, I took a nap after an hour of development. Then I woke up again and continue. To save some traveling time, I decide to jam at home this day because I was solo and I didn't need to go to the site to collaborate with my teammates. With software emulation feature of the libdinbo, I was able to develop the game without dialing the phone number. It saved me some cost of calling the number. With existing code base, the development went smoothly. I managed to implement the game play. After midnight, I started translating the game into Mandarin as well as English. I have also synthesized and recorded some sfx. 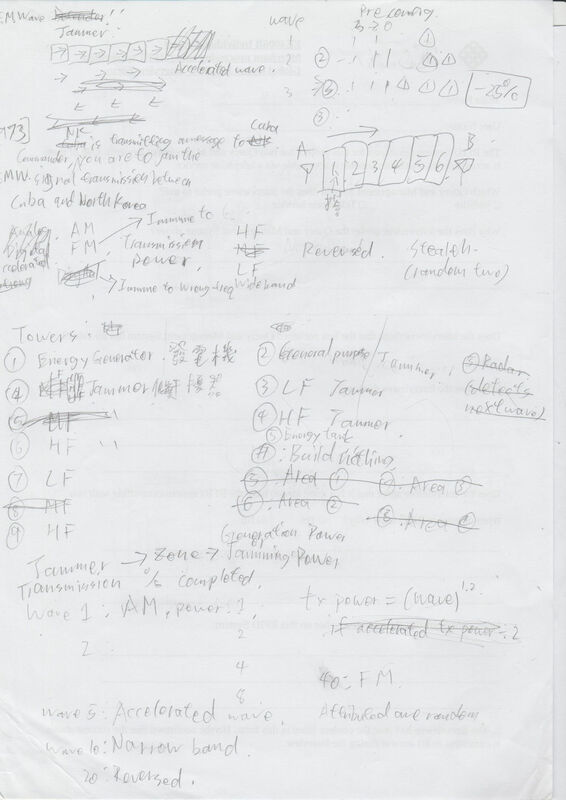 Originally I also planned to make music and recording the Cantonese voice myself. Considered that I need to prepare for the presentation, I decided to drop these features and went to bed. All of the development works ended here. However, I still haven't deployed it on the Dinbo Prototype B hardware. I (almost) dedicated this day for preparing for the presentation. I decided to prepare for the presentation before deploying it to the hardware. That is because the deadline of submitting the presentation was very tight. And preparing presentation before the deployment can buy me a bit extra time. I started with recording the gameplay audio using the voice log function of the libdinbo in its software emulation mode. It went quite well and I've recorded a 9 minutes audio. I had cut down the audio to 4.5 minutes. After that, I further cut down the audio to 1.5 minutes. Even the gameplay instruction were removed. So how did I explain the gameplay? Simple. I used Libreoffice Impress to make some presentation slides to visualize the game play frame by frame. Then I played the gameplay audio and used vokoscreen record the voice and the presentation slides. I clicks as I record and play the gameplay audio. After that, I used ffmpeg to trim beginning and the end of the video. Then convert the video format to webm. Here is the demonstration video in Cantonese. After that, I prepared another powerpoint file. I planned to use the powerpoint before playing the demonstration video. Everything went well, except that the deadline was very tight. I had to do everything I said above within like 3~4 hours. 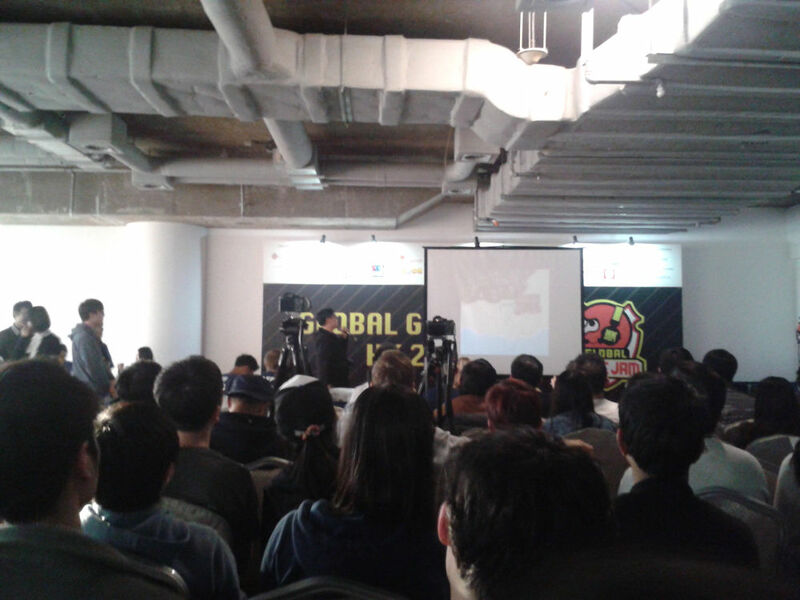 Then I uploaded my video to the website of Global Game Jam and sent the powerpoint to the staffs. After that, I have deployed my program to the Dinbo Prototype B hardware. Anyway, I have completed the game during the 48 hours. I have proven that libdinbo is working and I have shown my final year project to others. It is a great success compared with the previous jam. Right. That's "Unity Ramen, Salt Flavor with No Bug". Here is the blogpost of the guy who have taken this photo. He leaded the development of the game Super Smash Tokyo in this event. 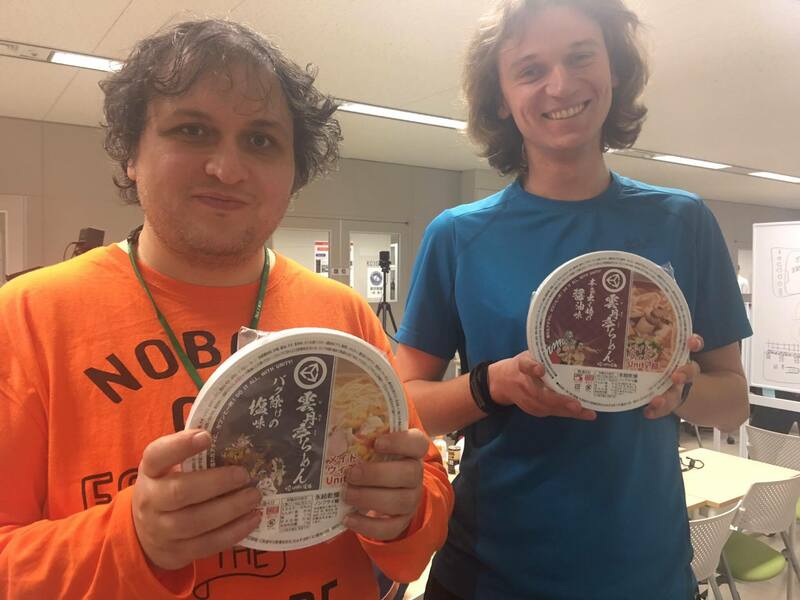 Apparently the jammers in Tokyo University of Technology site had more fun than we do. Instead of giving out awards to well-performing teams, they had a pizza party! And the award was the game itself that the jammers developed. It is a better match to the sprite of Game Jam. (for Hong Kong site only)Do not use powerpoint for presentation. Just use a video. Perhaps try other jam sites. Global Game Jam is about the experience. It may be interesting to try out the Macau SAR one, the Zhuhai, Shenzhen or the Guangzhou one. And I think I can reach these sites within a few hours. This game jam helps improving the code base for Dinbo Prototype B, particularly, the internationalization functionality of the code base was enhanced during the jam. In addition, it's also a good way to test whether the entire system works. If a game can be developed for this system, then it would definitely be possible for me to develop my final year project using the same system. Hey guys! Finally I got time to blog about the technical details behind the whack-a-mole game. Click here to view the previous part of this blog post, which is a release announcement of this game. The game is powered by Dinbo Prototype A, which is a telephone system that I developed using SIM900A module with Raspberry Pi 3. I knew. This system is stupid. 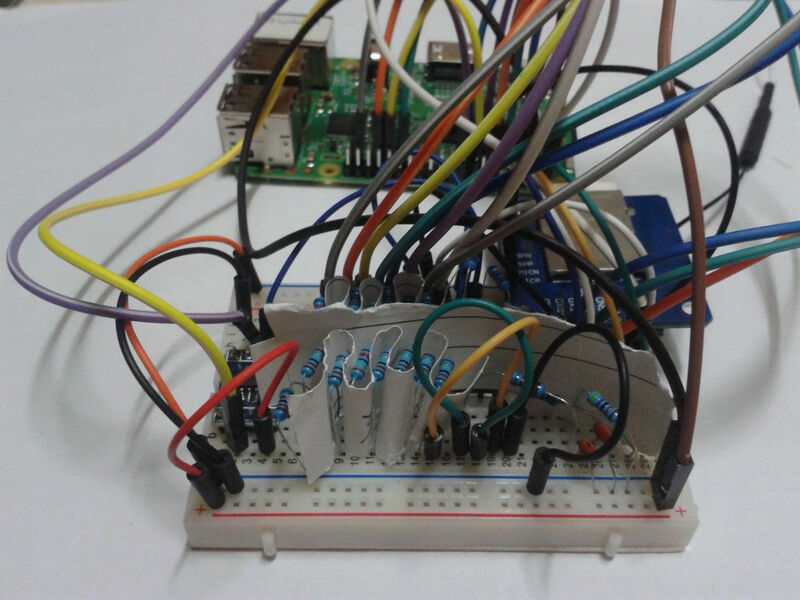 Instead of connecting the mic and speaker of SIM900A with Raspberry Pi, GPIO is used for voice communication between them. To make the thing even funnier, an ATtiny13 is used as an ADC. As shown above, the entire system is deployed on a breadboard. Due to the high current requirement, multiple breadboard wires is required for the power supply of SIM900A. A capacitor is also connected between VCC and GND to smooth the voltage level over time(not shown on the outdated photo above). Many programs were written for this system. They are ATtiny13 ADC program, serial multiplexer program, voice to socket program, and the whack-a-mole program. 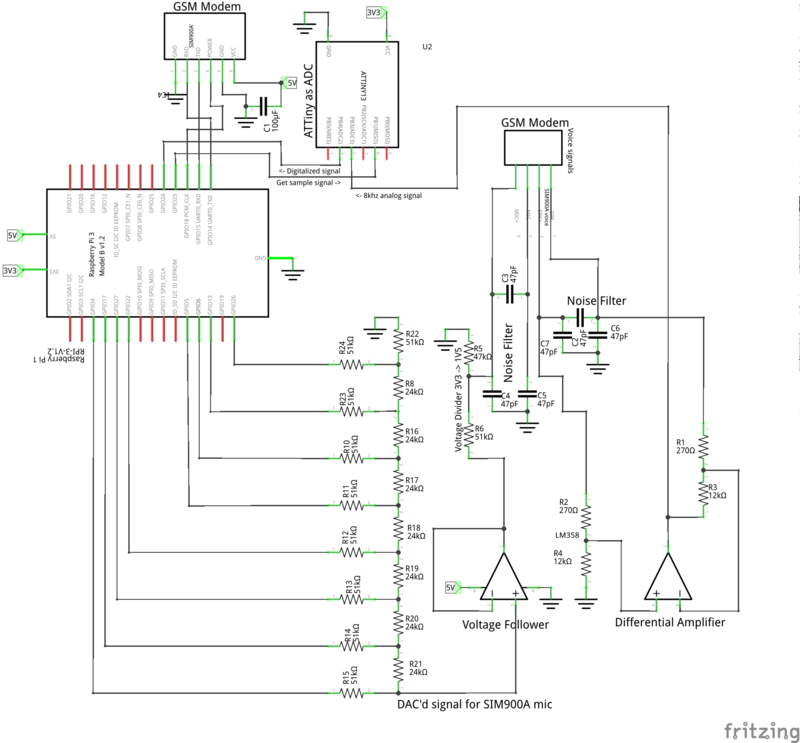 All of these programs are written in C.
The ATtiny13 ADC program, as its name suggests, is a program installed on the microcontoller for the purpose of converting the analog voice signal from SIM900A to time-based digital signal. When a "get sample" signal is received by PB1, it will read the analog input of PB3 send a digitized signal via PB4 to Raspberry Pi. This is the first non-Arduino embedded program I have ever developed. I had some fun on reading the specification of ATtiny13. The library avr-libc was used. The voice to socket program is a program that converts the digitized audio signal received from the ATtiny, then send it to the whack-a-mole program using unix socket file. This is the first real time program I have developed in my life. To achieve real time execution of code, a CPU core is reserved solely for the linux process of this program. The serial multiplexer allows multiple programs write to the serial interface of SIM900A. It redirects all of the data received from socket to the serial interface. It is adapted from this program found on Stack Overflow. The Whack-a-mole program works by communicating with the serial multiplexer as well as the voice to socket program. It also detects DTMF tones by processing the audio signal received. Other than that, it is just like other C programs. The source code of these programs are poorly organized. I still don't have time to package them. There are also some copyright issue on the serial multiplexer because majority of code is taken from the Stack Overflow answer with unspecified license. Therefore, I cannot release these programs too publicly. However, a copy of source code can be requested by email and they are considered on case-by-case basis. For the final year project of my college, the development of Dinbo Prototype B is started, which will be a successor of the current system. Standard analog audio interface will be used(instead of doing the analog<->digital conversion hack using GPIOs). I also plan to solder it on a perfboard. The library will be written in Python, which is much more flexible than C. It will be mainly designed for non-game telephone systems. However, it should be possible to make a game with it. After the completion of the library, I'll port this game to Dinbo Prototype B. I will update you guys about any news on it.